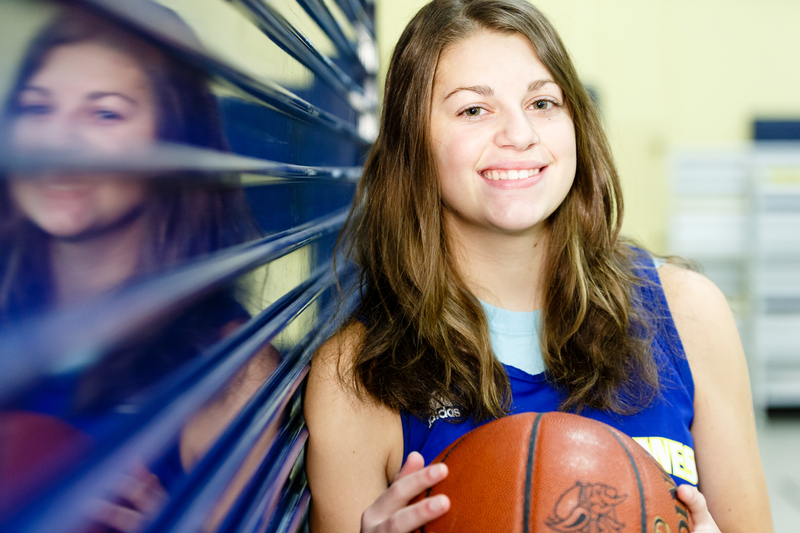 For New Berlin West's Alyssa Nelson, the best is yet to come. For Lady Vikings basketball fans, that is good news indeed. Nelson has that rare combination that can help a team in many ways. The first time I saw her play as a freshman, she came into the game, immediately got the ball outside the 3-point line and drained the shot. It wasn't the fact that she MADE the shot which impressed me, but the fact that she TOOK it. She only averaged 5.7 points per game (ppg), but she was third on the team in 3-pointers made her freshman year. First-year head coach Collin Thompson, who has been at West for nine years, talked about Nelson's move to varsity as a freshman. "When we started to slot players early in tryouts, we knew she would be an option," he said. "We knew she would be on the varsity sometime during the season, but we thought it would be toward the end of the season. When she scored 20 points on JV in the Brookfield Central Tournament (in November). We knew she was ready." Alyssa was more impressive as the season went on, showing up big time in the post-season. "She helped a ton," Thompson recalled. "When we beat (New Berlin) Eisenhower in the regional finals her freshman year she had 17 points. It was our first win over Eisenhower in years. When she scored 10 points in a 38-33 loss to Pius in the sectional final, we knew we had something special. "In the Eisenhower game Alyssa took control of situation. She has the unique ability to hit a floater or hit a mid-range jumper which is kind of lost in today's game. She was able to show the ball, get the defenders to jump at her 3-point shot and then she moved to a soft spot and hit the jumper and that's a lost art." Nelson realized her move to the varsity had a lot to do with her ability to put the ball in the hoop. "I was a little surprised, but people know I can score and that's why they did that," she said. "At first it was definitely a little scary, but having my sister (Jenna was a senior) there really helped. She said 'You deserve it,' so that really helped a lot. Her experience as a freshman helped her out last season. "It helped my confidence," she said. "I knew I could play on the varsity level." Thompson was excited when talking about Nelson's sophomore season. "She's very aggressive, she knows her strength, especially the last year and a half we've asked her to step up her offense," he said. "In practice she wants others to be involved, create with her teammates more. But when it comes to the game situation, she knows when it's her turn to take the shot or when it's time to drive and kick the extra pass. "In a year and half plus since she came up on varsity we can count on one hand how many bad shots she's taken. 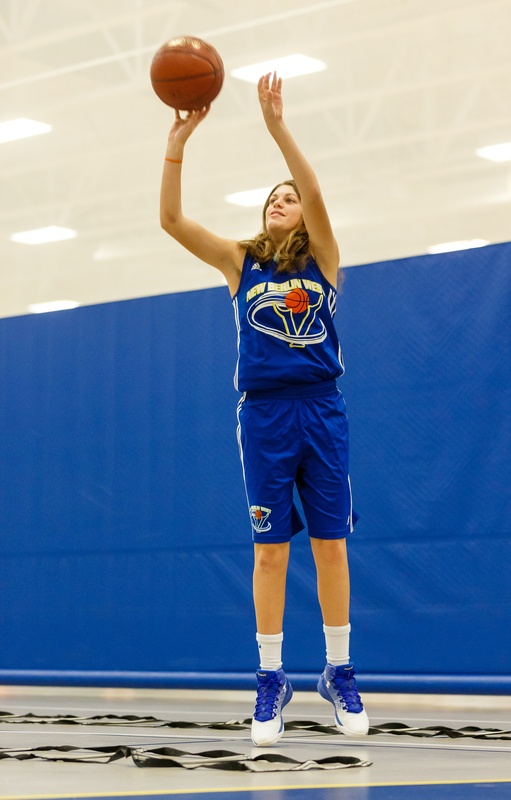 She has such a high basketball IQ you trust any sort of offensive impact she has on the game. "Her drive is to get better individually," he said. "She's a gym rat. She works out all the time. She's a girl who puts in the extra effort even though it's always been there." Nelson topped the team in six offensive categories as a sophomore, including points per game (13.0) and points (313), free-throw percentage (.844), 3-point percentage (.435), 3-pointers made (50) and attempted (115). She also averaged 3.5 rebounds per game and her 79 rebounds total ranked second on the team. She was third in assists (43) and assists per game (2.0) and third in steals (35) as her game continued to develop. Both Thompson and Nelson know there are still parts of her game she needs to work on. "She is continuing to work on her defense," Thompson said. "That was her real weakness her freshman year. That's improved quite a bit, but we still need her to dive on the floor for loose balls and create those energy plays for us. "Another weakness is she must always be on attack mode. You can see it when against good teams she averages high points while against the lower-tier teams she doesn't. She wants her teammates to get involved. "We have to get that mindset back - 'This is the opportunity I have to be in the attack mode' - because she has a future at the next level. Get better and get explosive all the time is a key for her. "She's a quiet girl who leads by example, but we need her to be more vocal on the floor," he said. "In practice she's very quiet. She's not a rah-rah type, but she understands the game and is willing to help her teammates." "We talked over summer about her giving us more in order for us to be competitive. Her rebounding this year has gotten tremendously better. She has a knack for the ball. She gets how the ball bounces. When she is more in attack mode she is only going to open up options for her teammates where she can kick for shots." The slightly built Nelson - whose nickname 'Chubby' was bestowed on her by a friend back in third grade - has a lot of pressure on her shoulders and is a key to her team's success. Alyssa knows what she needs to work on. "This year I can definitely get a lot of post-ups because people are laying off thinking I am going to stay on the perimeter," she said. "I'm changing that a little bit; definitely something I try to improve on." Nelson has the rare ability to drive the lane and softly flip the shot in while driving to the basket. So how does she do that? "Once I get to the lane, once I'm driving, I keep my eyes on the hoop," she said. "I don't focus on people coming at me." She also needs to get in the weight room more. "I need to get stronger so I can get more rebounds and play like I want to do," the 5-foot, 7 inch guard said. "Also becoming a leader verbally not just behind the scenes kind of thing. "I'm not exactly the loudest person on the team, so I just try to lead by example and hope people can follow that. On the court (leadership) is huge. It can make a difference between winning and losing." "I feel a little (pressure) from before the game," she said. "But once it starts, that's not where my mind is. It goes away. you forget about everything." Unlike some players, Alyssa has never seen a shot she's afraid of taking, especially in the big games when her numbers are better. "I know I shouldn't necessarily do that, but when the spotlight comes on against the better teams I know I have to do something to help this team win," she said. "My youth coaches back in seventh and eighth grade when we went to state always said 'Shoot the ball when you're open, don't hesitate' and I just try not to think about it. So when I get open, I shoot it." Thompson knows in order for the Lady Vikes to succeed, he needs Alyssa to be aggressive with her shot. "That's what's great about Alyssa," he said. "She is not afraid to miss that shot. She's willing to take it. We need someone to take control in big moments of big games and she's able to do that - raise up in the moment, be consistent with it and be that on court leader. It's important she makes sure she's a presence out there." But winning is the name of her game. "I'll do whatever I can to help us win," she said. "It's not necessarily about me and my points or whether I score. It's the win." FAVORITE MUSIC/GROUP: Drake, Rap Music. FAVORITE MOVIE: Blind Side, Action. FAVORITE TV SHOW: One Tree Hill. FAVORITE PLACE YOU VISITED: New York City. MOST MEMORABLE SPORTS MOMENT: Winning State Tournament in 8th Grade. WHAT WOULD YOU LIKE TO DO IN THE FUTURE? Attend College. Major in Radiology.